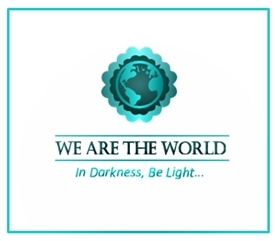 Welcome to the “We are the World Blogfest” (#WATWB ). The #WATWB was inspired by a simple conversation about how all the negativity on social media was weighing on us. Wanting to make a difference we decided to try to do our part to infuse social media with all the good stories that are out there. We hope to share the stories that show kindness, compassion, hope, overcoming challenges and in general, the impressive resilience of the human spirit. For every dark, negative story out there, there is a positive, heartwarming story that will add some light and lift the human spirit. The last Friday of every month bloggers will share their stories led by five co-hosts, this month’s co-hosts are Simon Falk, Inderpreet Uppal, Lynn Hallbrooks, Eric Lahti, and Mary J Giese. To learn more about #WATWB or to join us click here! Muniba Mazari AKA “Iron Lady” is currently living an inspiring life with her husband and son in Pakistan. She is an incredible artist, writer, singer, social activist, motivational speaker, model and ambassador for UN Women, promoting gender equality and women’s empowerment. Life hasn’t always been easy for Muniba, at the age of 21 while a university student working towards her BA, Muniba was involved in a horrific accident which left her paralyzed from the waist down and wheelchair-bound. Some people would have given up on life and wallowed under the circumstances, but not Muniba. After a period of frustration and hopelessness, Muniba found the strength to move forward realizing she had so much to be grateful for. Tired of staring at white hospital walls Muniba began to find her escape by creating bright colorful art which helped rejuvenate her spirit and brighten her days. She used art to break through the pain and find the beauty in her life. Muniba is much more than an artist though, she has become an advocate for turning adversities into opportunities. After viewing an advertisement, Muniba began to realize how society objectifies disability, seeing it as a shortcoming. Muniba decided to use her voice, her art, and her spirit to change society’s perceptions of what it means to be disabled. She has carved a wonderful life for herself embracing the positives and not letting anything stop her. Muniba went from being a victim of her fate to being a fighter in life. As a motivational speaker, Muniba shares her story and is a wonderful role model who teaches us that limitations are just an illusion we create for ourselves but with passion and perseverance nothing can stop us from achieving our goals. Iron lady, indeed! She is a monumental inspiration. Thank you for sharing this, Belinda. Muniba is certainly an inspiration to all who face hardship of any kind. To not give up or find and excuse can be so difficult, but she found a way to overcome as a speaker, artist, wife and mother. Thanks for sharing her story, Belinda, and for leading the #WATWB each and every month. Isn’t it wonderful when we focus on what we can do for others rather than focusing on ourselves and the things we may not be able to do. It creates such a positive outlook and that joy feeds itself the more we see the results in others. I wish Muniba nothing but the best and hope she continues to be an inspiration well into the future. I think it was her setting aside the negatives in her life and choosing the positive that really got to me. That is not always easy to do. Thanks for sharing this wonderful #WATWB post. Wow, Muniba is an incredible inspiration – such transformation through loss. I think Iron Lady is a beautiful empowered title to claim, and I celebrate her attitude. Thanks for sharing this one Belinda. Wonderful woman, and an absolute inspiration. WATWB always uplifts me when I’m down in the dumps– thanks for sharing this story, Belinda! Bruce Lee once said, “You only fail when you fail to learn.” His point was learning from being beaten in a fight and coming back stronger, but it’s applicable to a lot of things that we see as failures or shortcomings. It’s easy to give in to our problems and let them control our lives. So nice to see someone overcoming them. What a wonderful woman! It’s always so refreshing to see the victim attitude being turned into one of survivor… So inspiring. Thanks for sharing, Belinda. What an inspirational woman! When things seem the bleakest, we often find just what we need to continue moving forward. Thank you, Belinda, for sharing her story with us for WATWB. That is so wonderful. I’ll come back later to watch her Tedtalk. Thanks for bringing this story to light! Thanks for visiting my blog during this blogfest. I love Muniba’s twitter quote. Despite the challenges life has thrown at her, she is an amazing, positive and inspirational woman! I heard her story and was drawn to hear more. She has such inner strength, I’m in awe! Thanks so much for stopping by! Have a wonderful week!